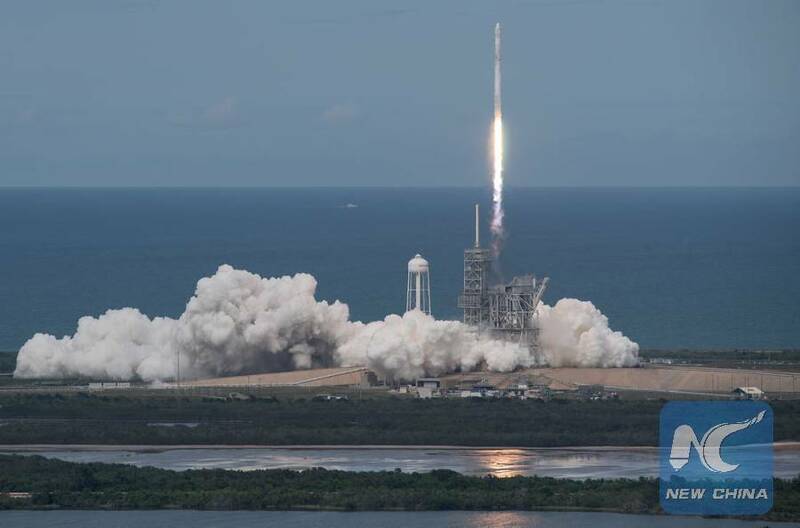 WASHINGTON, June 3 (Xinhua) -- SpaceX on Saturday launched a shipment of supplies for the astronauts living at the International Space Station, carrying for the first time an experiment independently designed by China. About 10 minutes later, SpaceX successfully landed the rocket's first stage at the company's Landing Zone 1, just south of the launch site at Cape Canaveral Air Force Station, as part of its effort to develop fully reusable rockets. On this trip, the Dragon will deliver almost 6,000 pounds (2,700 km) of supplies, including solar panels, tools for Earth-observation and equipment to study neutron stars. If all goes well, it will arrive at the space station on Monday. The Chinese payload was first reported in 2015, when an agreement was reached with NanoRacks, a Houston-based company that offers services for the commercial utilization of the space station. Under the agreement, NanoRacks will deliver the device studying the effects of space environments on DNA to the U.S. side of the space station and astronauts there will conduct studies using the device in about two weeks, data from which will be sent back to the Chinese researchers. "This is not the first Chinese experiment on the International Space Station (ISS)," the spokesperson said. "Chinese scientists have been investigators and co-investigators on international experiments conducted on the ISS, including for the Alpha Magnetic Spectrometer investigation on ISS." However, Professor Deng Yulin, who led the Chinese research, said that this is the first time an ISS experiment has been independently designed and fabricated in China. "This cooperation does not violate any laws and regulations, including the Wolf amendment. We do it in an open and visible way," Deng told Xinhua. "This is a new model of cooperation that we can follow in the future." "We think it's really an important research and they have done a great job," Mary Murphy, senior internal payloads manager of NanoRacks, told Xinhua, calling the cooperation between the two "a good example." Leroy Chiao, a former Chinese-American NASA astronaut and ISS commander, highlighted the significance of the Chinese project. "I think this is a good step forward," Chiao said. "I have always believed that cooperation is the best way forward for both the U.S. and China, particularly using civil space exploration as an avenue." Joan Johnson-Freese, a space policy analyst at the U.S. Naval War College, said that it evidences the growing importance of commercial space. "Space is no longer just the purview of government activity," Johnson-Freese said. "Space is developing as an area of commercial activity, much like cars and computers, which is a big change from the past." SpaceX CRS-11 was the 11th of up to 20 missions to the space station that the California-based company will fly for NASA. It also marked the first time that SpaceX has launched a spaceship that has been used on a previous mission to the space station.